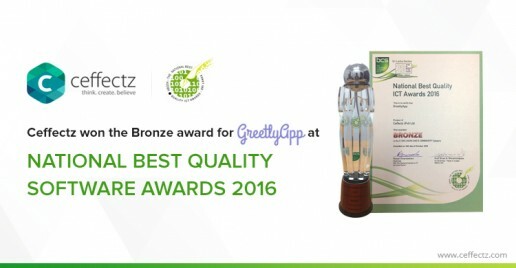 On the 14th of September 2016, a grand awards ceremony was held to reward the winners of the National Best Quality Software Awards 2016 at which Ceffectz (Pvt) Ltd managed to win a bronze award for its product GreetlyApp. The event was graced by the Chief Guest Hon. Harin Fernando, Minister of Telecommunication and Digital Infrastructure in Sri Lanka. National Best Quality Awards ICT competition is an annual event in the Sri Lankan calendar, which is organized by the chartered institute for IT (BCS – UK, The CIIT) Sri Lankan section. 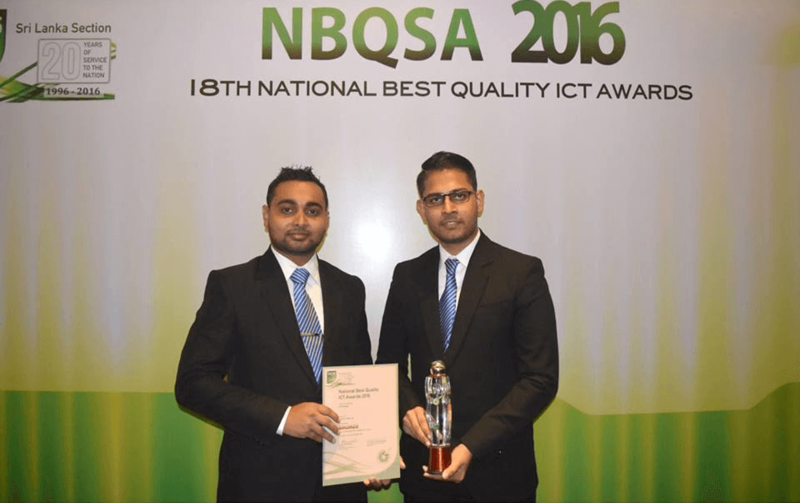 NBQSA was organized under 19 categories for both students and commercial sectors and Ceffectz emerged triumphant in the e-Inclusion and e-Community category as a bronze award winner. Among the other categories were fields such as security, healthcare, tourism, education etc. Gold, Silver and bronze awards were presented in these categories and only around 65 commercial and tertiary winners were recognized from all over the island out of which GreetlyApp stood out. This year, the competition was held for the 18th consecutive time since its inception in 1998. The motive behind this great initiative is to provide recognition to outstanding achievements of individuals and organizations in Sri Lanka, to provide a window to gain international recognition for local ICT products and to improve the quality of local ICT products as to equal international standards. Ceffectz (Pvt) Ltd represented by its Founder & CEO – Mr. Buwaneka Ranatunge was recognized by the industry leaders and government officers for its contribution towards the society and development of ICT in Sri Lanka. As a global competitor, Ceffectz holds a reputed position in the local ICT industry as well. Ceffectz thrives on taking its products to the global market and meeting international standards by putting together a recipe of three unique ingredients- collaborative imagination, newest technology and cutting edge designs. Ceffectz as a startup based in Sri Lanka raises the bar up high for local organizations. As a team of visionaries, they provide a range of services to fulfill the needs of the public including the creation of interactive designs, user interfaces, mobile/web applications etc. In this technologically driven era, the dedicated team at Ceffectz works with determination to bring unique and high-quality products to the table. Quality, simplicity and professionalism are three features specifically maintained at Ceffectz. They believe that building a long term relationship of trust with their clients and focusing on every project with special attention is a reason for their success. GreetlyApp which won the bronze award at NBQSA 2016 is a Mobile/web application developed by Ceffectz which showcases both professionalism and simplicity. The app will be available from November on Google Play for Android users and is currently available on App Store for Apple users. This is a perfect,modern day alternative to real life greeting cards. The app is developed to enable users to share greetings with anyone, anytime and anywhere in the world. It’s a strategy to stay connected to family and friends even at hard pressed times in life. Ceffectz promotes its customers to spread love and share positive thoughts during any special moments or occasions. Whether it is a reason to celebrate or not, this is an opportunity to remind your loved ones that they are in your thoughts. The layout is simple and easy to understand. Users can select from more than 1000 perfectly designed cards and personalise with messages and stickers. It’s easier than ever once you select the contact and press send. GreetlyApp promotes creativity and innovation with a flawless design and structure. What’s more is that the system has established a useful reminder service to make sure that the user remembers every special occasion, even when not kept in mind. This is an initiative taken by Ceffectz to create a 100% green environment by discouraging the use of cards made out of paper at the cost of trees. 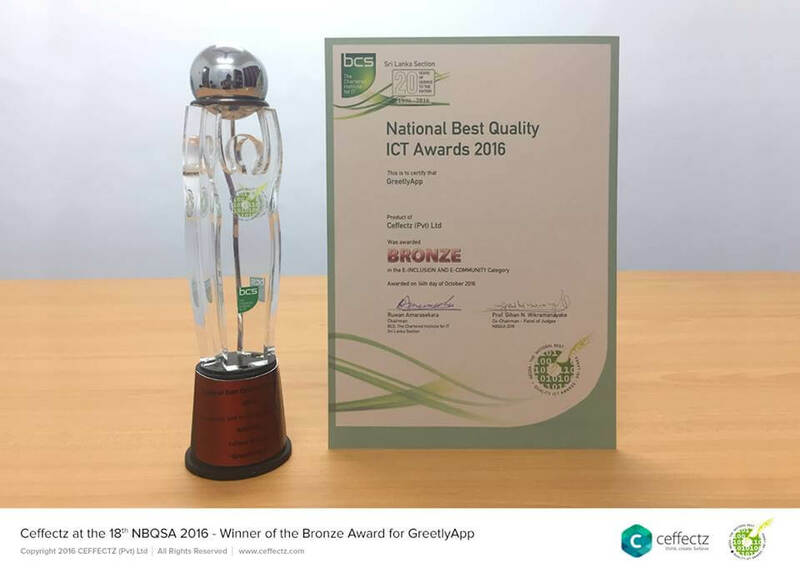 Ceffectz is a well-deserved winner of the bronze award at NBQSA 2016 since it has identified its responsibilities towards the betterment of the world. GreetlyApp has not only proven to be a success but also a step was taken towards building an environmentally friendly society. Among many of the competitors, Ceffectz managed to showcase brilliance and stand out with the launch of one of its finest products;GreetlyApp. GreetlyApp renders an immeasurable service and adds value to lives of people all over the world. GreetlyApp will continue to be an innovation mastered to be resourceful and efficient. Ceffectz as a leading ICT organization has introduced GreetlyApp as well as CV Showcase which function as yet another web/mobile application. 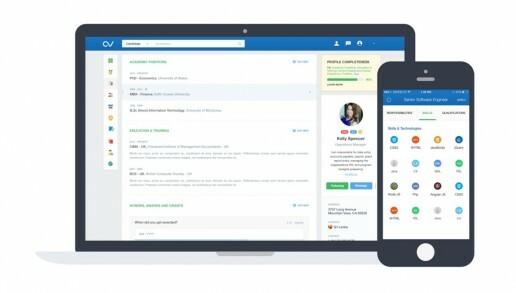 CV Showcase is the ultimate employment platform connecting job seekers and employers. Whether to find and recruit the most skilled staff or to find your dream job, CV Showcase comes in handy. As an organization Ceffectz is climbing up the ladder of success with such signs of great potential. Though many more challenges need to be faced down the road, Ceffectz is holding on to its strengths. 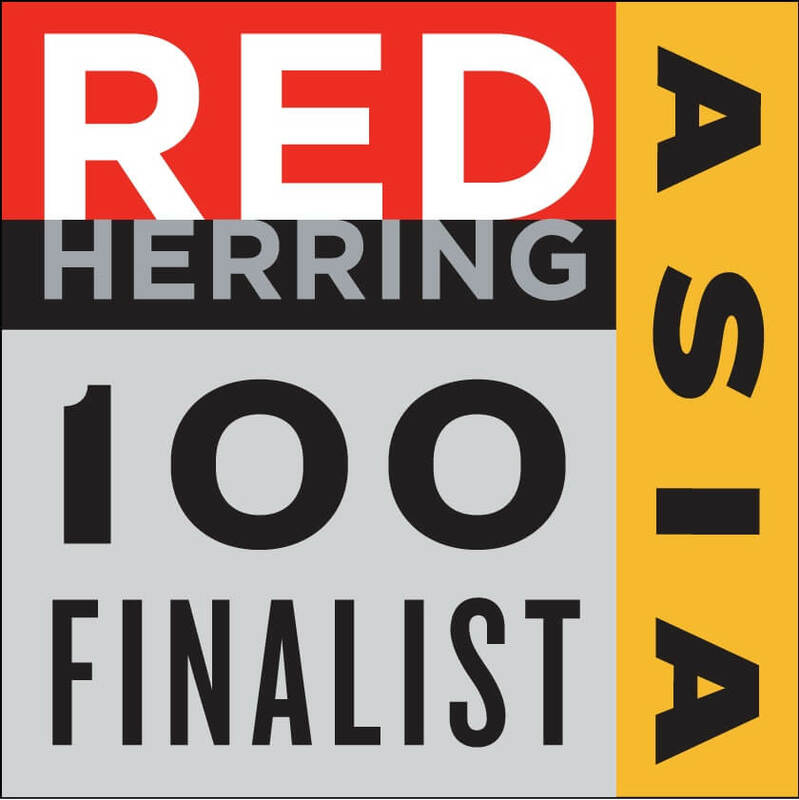 Makati, Manila — Today, Red Herring announced its Top 100 Asia award winners in recognition of the leading private companies from the region, celebrating these startups’ innovations and technologies across their respective industries. 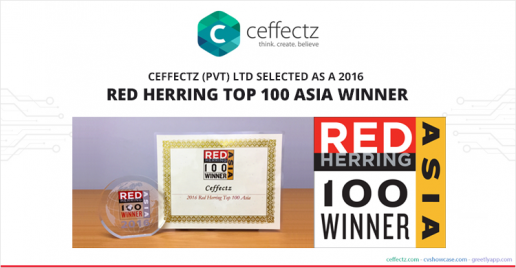 Red Herring Top 100 Asia enlists outstanding entrepreneurs and promising companies. It selects the award winners from approximately 2000 privately financed companies each year in the Asia. Since 1996, Red Herring has kept tabs on these up-and-comers. Red Herring editors were among the first to recognize that companies such as Google, Facebook, Kakao, Alibaba, Twitter, Rakuten, Salesforce.com, Xiaomi and YouTube would change the way we live and work. Red Herring’s editorial staff evaluated companies on both quantitative and qualitative criteria, such as financial performance, technological innovation and intellectual property, DNA of the founders, business model, customer footprint and market penetration. This assessment of potential is complemented by a review of the track record and standing of startups relative to their sector peers, allowing Red Herring to see past the “buzz” and make the list a valuable instrument of discovery and advocacy for the most promising new business models in Asia. 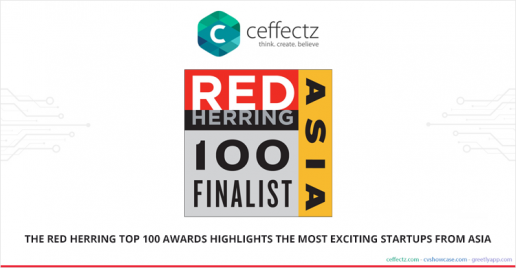 Sri Lanka, Colombo – August 18th 2016 – Ceffectz (Pvt) Ltd announced today it had been short-listed for a Top 100 Asia award, a prestigious list honoring the year’s most promising private technology ventures from the Asia business region. Red Herring has been selecting the most exciting and promising start-ups and “scale ups” since 1995. Finalists are still evaluated individually from a large pool of hundreds of candidates based across Asia. Twenty major criteria underlie the scoring and process. They include, among others: the candidate company’s addressable market size, its IP and patents, its financing, the proof of concept, trailing revenues and management’s expertise. Each company goes through an individual interview after filling out a thorough submission, complemented by due diligence from the Red Herring panel. The list of finalists includes some of the best performing and prominent companies of that year. This unique assessment of potential is in addition to a review of the company’s actual track record and standing, which allows Red Herring to see past the “buzz” and make the list a valuable instrument for discovering and advocating the greatest business opportunities in the industry. Notable Top 100 Asia winners include Alibaba, Baidu, InMobi, Kakao, Rakuten, Snapdeal, Xioami and many more. The short-listed companies face one final challenge – a live presentation at the Red Herring Asia Forum taking place on September 12-14 in Manila, Philippines. After the total scores are summed, the Top 100 winners are announced at a special awards ceremony the evening of September 14. Continuing to inspire people with its success story, Ceffectz contemplates to address the global tech conference, RISE 2016. From the most exciting startups to the world’s biggest companies, RISE has undoubtedly been an exceptional platform where inspirational stories are shared among thousands of attendees under one roof. 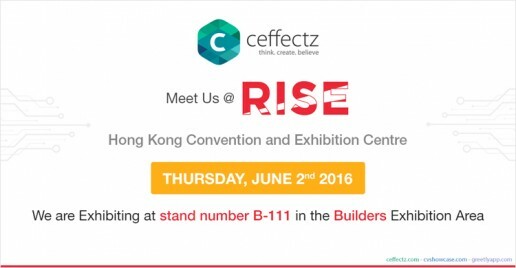 Surfacing among the best in the industry, Ceffectz aspires to excel by making its presence felt at the Hong Kong Convention and Exhibition centre from the 31st of May to the 2nd of June 2016. Ceffectz, a recipe of three vital ingredients; collaborative imagination, cutting edge designs and newest technology stands out as an uncomplicated mobile/web development firm with intentions of gaining perfection through simplicity. Assisting you with the best of our capabilities, we at Ceffectz exert maximum effort to bestow you with exceptional service using our collective imagination. Alternatively, we ensure that our designs enhance the specific service we provide using the newest technology to craft modern and innovative solutions to deliver nothing but the best. While the company specialities include professional graphic designing, UX/UI designing for web/mobile, web application development, mobile application development, software development and professional IT consultation, the services at Ceffectz subsume lengthened research and attention to every little detail or client requirement. The product “CV Showcase” is one unique illustration of brilliance and excellence rendered by Ceffectz. Serving job seekers and companies simultaneously, CV Showcase is an outstanding platform in terms of recruitment and employment. Finally, when it comes to developing web applications and mobile applications, your idea is everything we require to create an astonishing web and mobile app with greater user experience. Therefore, by networking in the presence of investors and large-scale companies at RISE 2016, Ceffectz anticipates to take one further step in the journey to success. 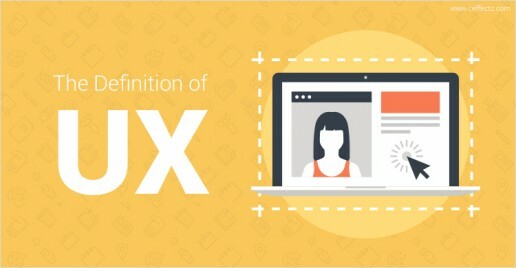 In simple terms, UX (User Experience) is used to explain a user’s overall satisfaction level when using a given product, service or system. Human – computer interaction is a term that covers all characteristics of the ways that people interact with computers. A large number of computer based technologies are introduced on a daily basis while people are coming to contact with them regularly and more rapidly. 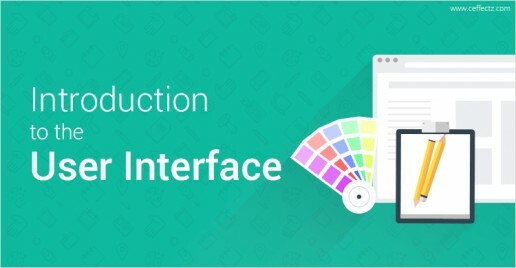 When a user interacts with a computer, they usually do it via a user interface (UI). It’s true that the world is revolving at an uncontrollable speed and technological advances are witnessed on a daily basis, but one cannot disregard the constant threats that arise from cyber attacks and various security breaches. 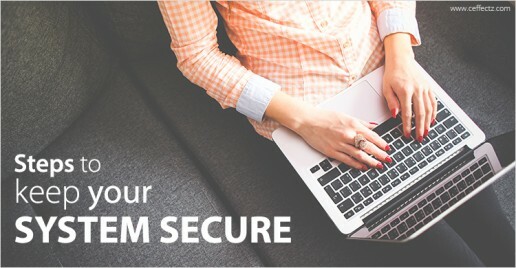 Therefore, it is very important for companies and individuals to actively take steps to protect data and information that are available online and stores in their computers. They have to ensure that customers are able to communicate with them using secure methods. It is not easy to provide high levels of security with such complex systems and challenging environments. Here are a few ideas as to how you can keep your system secure and handle your customer data with care. As much as we make use of the desktop computer or the laptop, we have also seen an explosive growth in smartphones and tablet sales. Therefore, a website that has been optimized for desktop computers in no longer adequate if you want to be ahead of your competition. People now expect each and every company to provide a website that can be viewed and accessed through any of their devices. Converting a desktop website or application to one that can be viewed on a mobile device does not only consist of shrinking the screen to fit the device’s display. Various devices consist of certain limitations and formats. 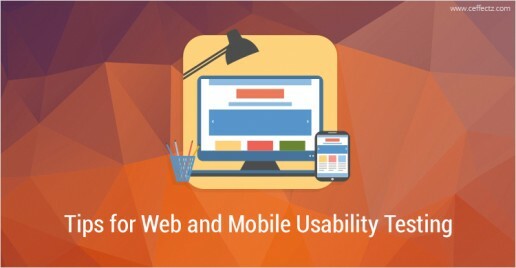 Hence, usability plays a critical role when it comes to websites or applications. In this blog post, we try to understand the primary differences and tips that can be used in both web and mobile usability testing. Gmail has advanced leaps and bounds ever since it’s initial launch in 2004. People have adjusted according to the technology they use and Gmail without a doubt has taken over with more than 500 million Gmail users as at January 2014. This figure must have increased rapidly following the Gmail statistics according to DMR. 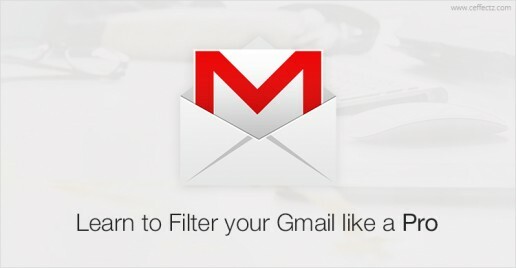 Even though there is a massive user base for Gmail as a whole, we see only a small subset that digs deeper into the advance features that it offers.